Norfolk County Council had a policy to attempt where possible to convert disused railway lines into long distance, traffic free footpaths. Norfolk County Council purchased the line from Norwich through to Aylsham via Lenwade, Reepham and Cawston. The Section from Aylsham to Wroxham was purchased by Broadland District Council. Broadland District Council looked for a solution of how to finance the new footpath including signage and access points. A number of the elected Council members and also officers were railway enthusiasts and a suggestion was put forward that a Narrow Gauge Railway be built on the route. The reason for narrow gauge was that it would only require half of the trackbed and so would leave space for the footpath. Under English law railways need to be fenced. The result was that the railway company would prepare the route for both the footpath and the railway. The railway would be fenced off leaving a safe footpath. The contract to build the railway was won by John Edwards and Mr R Hudson, who were automotive engineers in Great Yarmouth. To raise the required capital they went into partnership with RKF Limited which owned the Pleasurewood Hills Theme park in Great Yarmouth. Construction of the line started on 8th May 1989 and progressed quickly. The line was ready to open with all due ceremony on 10th July 1990. Whilst the railway had built 20 modern and comfortable carriages and well-built modern station facilities, it did not have the required capital or time to obtain steam locomotives to operate the railway. As a result locomotives were hired in from the Romney Hythe and Dymchurch Railway in Kent. Due to high interest rates prevailing in 1990, RKF went into receivership which forced the railway into the same situation. For a period the railway was run by the administrators, before it was sold to the Hart Family of Sheffield. Mike Hart being the Chairman of the Ffestiniog Railway in North Wales. At this point the Romney Engines returned to Kent. Alternative motive power was sought and this arrived in the form of “Sian” formerly of the Fairbourne Railway in Mid Wales, Sandy River No. 24 which had also been built at Fairbourne. The third locomotive was Tracey Jo a steam outline diesel powered locomotive. Tracey Jo was converted to a true steam locomotive by Winson Engineering in 1992 and renamed Wroxham Broad. She remains a BVR locomotive to this day. In 1993 The Hart Family sold the railway to Robert Baker of Suffolk. Robert realised the need for investment in more powerful locomotives. In 1994 the first of purpose built ZB locomotives arrived. In ten years of existence the railway had 5 sets of owners. What it needed was stability and sound management. This was to come in 2001 when the line was acquired by a small group of railway enthusiasts from a business background. The railway has now enjoyed stability under the same ownership for 15 years. 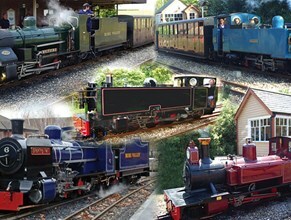 Today the railway is owned by a small group of Railway enthusiasts with hands on directors. No dividends are paid to shareholders and all profits are reinvested in developing and securing the long term future of the railway and improving facilities. On 10th July 2015 the Railway celebrated it's 25th Anniversary with a gala weekend which saw the return of not only the first steam loco on the line "Winston Churchill" but also the men who drove her. With the Directors and the Friends of the Bure Valley Railway working closely together the future for the line looks very bright.